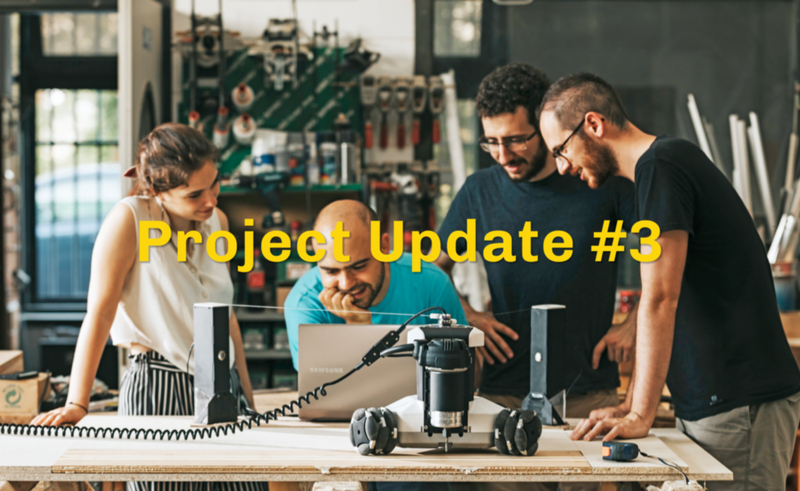 Hello everybody, and welcome to the third update about the project development of Goliath CNC! From the Project Update #1 we shared with you the need and desire of growing the Springa team, and we have good news on that side: in about 2 months we doubled the number of team members, becoming 6 people! Fabio comes from the heart of Valtellina, a valley of northern Italy among the Alps. Graduated in Computer Science he joined Springa as Software Embedded Engineer. He works on Firmware and Software development. From the Alps to the seaside: Denis is an Industrial Designer from the Adriatic Coast, came to Milano to complete his studies in Design & Engineering. He works on the sensors, improving both mechanics, usability, and manufacturability. Davide is from one of the most famous furniture makers areas of our country (a sign of destiny?). Developing his thesis project for Mechanical Engineering M.Sc. he works on the control of Goliath CNC performances and sensor system, supporting our CTO Alessandro. As us founders, also all the new guys comes from the Politecnico di Milano university! In the last update, we mentioned that we wanted to start using small cyclone filters. During the last month, we began the process of the integration of the filters with the vacuum motor to the rear integrated bin. We put together all the components we design, studied, tested and bought with a result which is pretty far from a good aesthetic but it’s close to the efficiency and performance goals we worked for. Once our Goliath – Frankenstein was assembled, we started running some tests. We registered good results at the same time, but unfortunately, we also find out a problem: we were not filtering the thinnest dust. Due to this further aspect to deal with, we decided to look for an extra support. We spent enough time on the dust collector development, we learned a lot of things, but it is time to be fully committed to the design for manufacturing of the rest of the project. We already found and meet a couple of companies with a strong experience in the vacuum systems, in the next weeks we will have some further meetings to go deeper into the discussion and let this project continue.